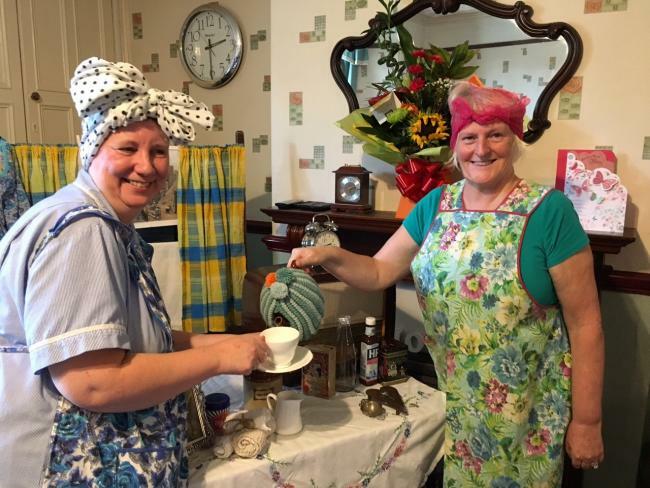 Townfield & Coach House Care Raised £481.09 at our Macmillan Coffee Afternoon. An Afternoon of reminiscing, cake, coffee, tombola and many games helped to raise £481.09 for Macmillan Cancer Support. Michael Timmins (Managing Director) Said “On behalf of Macmillan Cancer Support, We would like to thank everyone for your support in our fundraising for Macmillan Cancer Support. Our Macmillan Coffee Afternoon and Raffle raised an amazing £481.09. Come along for a catch up over a cuppa and a slice of something delicious for a great cause. Townfield Care are delighted to invite you to celebrate the World’s Biggest Coffee Afternoon with us at our care home on Church Street, Great Harwood. Why not come and join us for a coffee, catch up and a chat and also help raise money for a great cause. Everyone is welcome. Townfield Care are proud to be supporting a worthwhile Charity such as Macmillan. 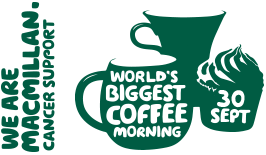 People all over the UK will be hosting their own coffee mornings and funds from our event will be donated so they may continue their great work providing practical, medical and financial support and push for better cancer care. Great Harwood & Rishton Soroptimist’s donate their award winning Sensory cushion to Townfield & Coach House Care Home. 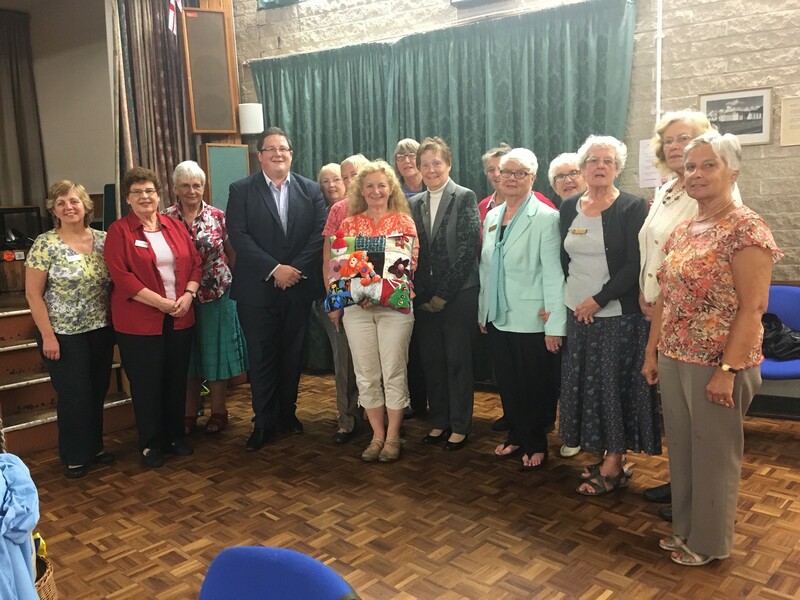 The Cushion which recently won the Soroptimist’s regional rose bowl competition was designed and produced by members of the group to help raise the awareness of dementia. The cushion will now be used by Townfield & Coach House who care for up to 28 people with dementia for sensory stimulation and a talking point within the home. The Soroptimist’s are a group of women who meet regularly for both formal meetings and social events. Their main aims are to improve the lives of women and girls in the local area, UK and across the world. John Timmins Managing Director of Townfield Care Ltd stated “The dementia cushion which the group have designed and kindly donated to the home will be used by many people we care for and support. Studies into sensory stimulation have shown that activities which stimulate the mind can be key to alleviating stress and discomfort. Often people with dementia become restless and the stimulation of the activity cushions can help to reduce many issues such as wandering or restlessness. The cushion will not only keep hands busy, but it will provide a wonderful source of visual, tactile and sensory stimulation as well as Helping to keep hands and wrists active and supple aiding circulation. Sherwood House Care Home has been rated as “good” in all areas by the Care Quality Commission. The CQC, the independent regulator for all Health & Social Care providers, carried out the unannounced inspection of the Care home in Clifton Street, Rishton over two dates of 29th June 16 and 5th July 16. The inspectors rated it as good against the core inspection criteria of being Safe, Caring, Effective, Responsive to residents’ needs and Well led. The Inspectors said “We were shown around the whole building as part of the inspection. We saw that the interior decoration was clean, bright and well maintained. People had arranged their rooms as they wished with personal possessions they had brought with them One person told the inspector “ I like the place it’s homely and my room is very nice”. Kath Howard, Registered Manager said: “It is a credit to the dedication of the care team that the home was rated as good by the CQC inspectors. Townfield & Coach House has been labelled as ‘Good’ by the Care Quality Commission in a new report. Townfield & Coach House Care Home landed the good rating by the independent regulator following a 2 day unannounced inspection and positive reports from staff and residents of the home. Other positive points highlighted added that staff were receiving suitable and regular training to a good standard, and that residents said they had a good level of support from staff. CQC’s Chief Inspector for Adult Social Care in the North, said “People are entitled to services which provide safe, effective, compassionate and high quality care. We assess services against five key questions – Is the service caring? Is the service effective? Is the service safe? Is the service well led? Is the service responsive? – and rate each question and the service overall. John Timmins, Managing Director said: “The staff team is committed and work very hard to achieve a homely caring environment for the residents, their families and friends.It was the team’s hard work, commitment and enthusiasm that assisted in gaining the “Good” rating from CQC. I am very proud of them and what they have achieved at Townfield & Coach House. Kath Howard, Registered Manager of Townfield & Coach House, said: “I am delighted and proud of the achievements made by the whole team. The result is a reflection of their determination and enthusiasm to provide an outstanding service for our clients, relatives and colleagues. Townfield Care are delighted to have been presented with the Hyndburn Business Award for Employer of the Year 2016. The category, sponsored by Meltis HR Ltd, offered tough competition from a selection of 200 of Hyndburn’s best businesses. Enterprising People organised the inaugural Hyndburn Business Awards and a superb awards evening which was held at Accrington town hall. Maria Timmins, Michael Timmins, John Timmins & Kath Howard attended the event to receive the award on behalf of the company. Michael Timmins (Managing Director) stated “This award recognises how companies manage and develop the people that work for them. 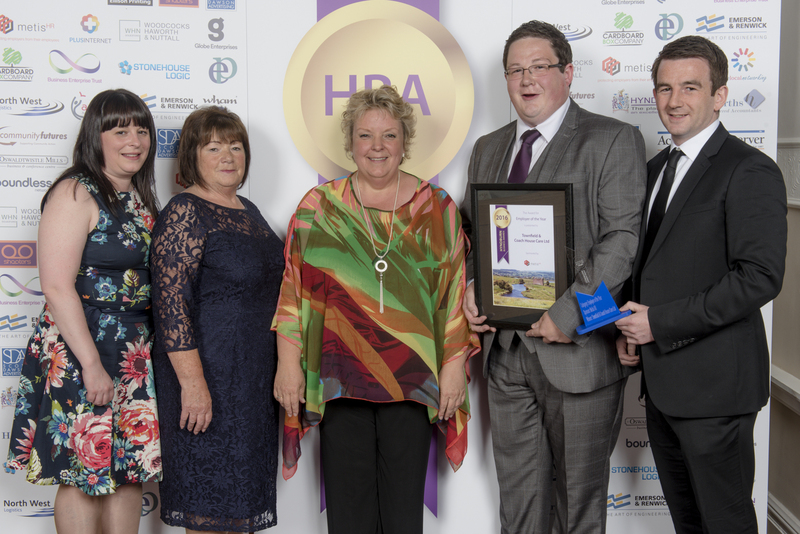 We are therefore particularly pleased to have won it in recognition of our recently launched Care Academy but also because of the importance we give to the support & development of all the people who work at Townfield Care”. The title of Employer of the Year reflects the company’s dedication to recruitment & development of the right people to provide the highest level of care and support. Townfield Care employs a predominantly local workforce who benefit from attending Townfield’s Care Academy. John Timmins (Managing Director) said “Townfield Care is committed to providing what we believe is a quality training. We have recently increased our investment in the programme, and due to the increasing demand of social care have plans to recruit over 100 additional people this year. We consider our employees to be the foundation of the company’s success. It is imperative that we pass on essential skills and knowledge to ensure the continued success of Townfield Care”. Townfield Care is pleased to announce that it has once again been awarded the Investors In People Accreditation, in recognition of its ongoing commitment to excellence. The company has held the accreditation for 15 years since 2001. The Investors in People (IIP) Standard defines what it takes to lead, support and manage people well for sustainable results. Based on 25 years of leading practice, the Investors in People Standard is underpinned by a rigorous assessment methodology and a framework which reflects the very latest workplace trends, essential skills and effective structures required to outperform in any industry. The Investors in People accreditation has been the sign of excellence, a great employer and an outperforming place to work. To achieve the re-accreditation, a selection of staff at across the company, from senior management to the public-facing carers, took part in 2 days of interviews designed to review and evaluate the company’s strategy, training plans and leadership. The process takes place every three years. Townfield Care pride themselves on offering high-quality, person-centred care which is tailored to the needs of the individual. The Long Service Awards Program celebrates and commemorates the long-term commitment and loyalty of Townfield Care employees who have achieved significant milestone years of service. The Long Service Awards Program, initiated in 2013, recognizes 5 year milestones of employment with the Townfield Care. Award recipients are presented with an award and the newly introduced lapel pin badges at the company awards nights held each year. 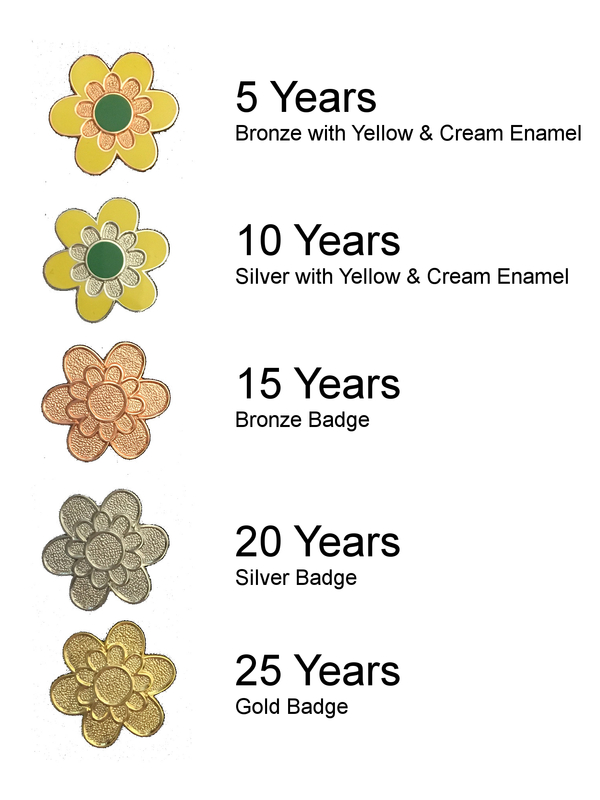 The Elegant lapel pins are designed from the flower in the Townfield Care Logo and are coloured based on the number of years service.